RUACH is the Hebrew word for spirit, and it is exactly that quality which the songs of the Ruach series possess. 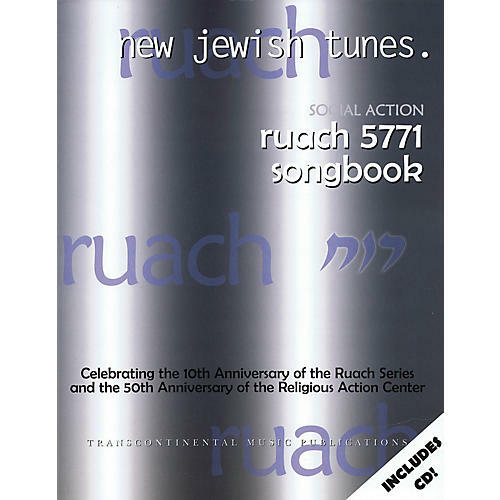 Ruach 5771, the sixth edition in the set, celebrates the 10th anniversary of the Ruach series and the 50th anniversary of the URJ's Religious Action Center in Washington D.C. Many of the 19 tracks included here feature a social action theme, and all reflect the spirit, energy, and vibrancy of the Judaism that lives and breathes in the camps, youth groups, and synagogues of the Union for Reform Judaism. Favorite artists like Dan Nichols, Josh Nelson, Michelle Citrin, Craig Taubman, Peri Smilow, and Rick Recht have contributed to this compilation, along with exciting new voices on the Jewish music scene such as Jay Rapoport, Elana Jagoda, Mikey Pauker, Alan Goodis, and SoulAviv. Catch the Ruach!